Perfect for the bathroom, bedroom, study or commonly used as a Food Waste Bin. 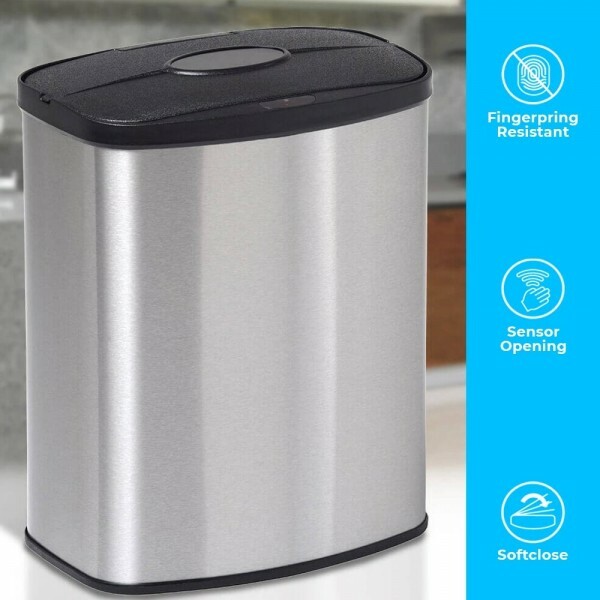 The 8L kitchen food waste bin is compact, convenient and the motion activated sensor means it's a must have hygiene friendly bin for your home. Our 8 Litre food waste bin is a mini oval bin with a removable inner bucket that if you choose to use a bag, even a shopping carrier bag will do. The lid opens and closes automatically powered by batteries and lasting on average about 2 years. This model can be utilised as a kitchen food waste bin, a kitchen cupboard bin or as a waste paper bin in the bathroom or bedroom. 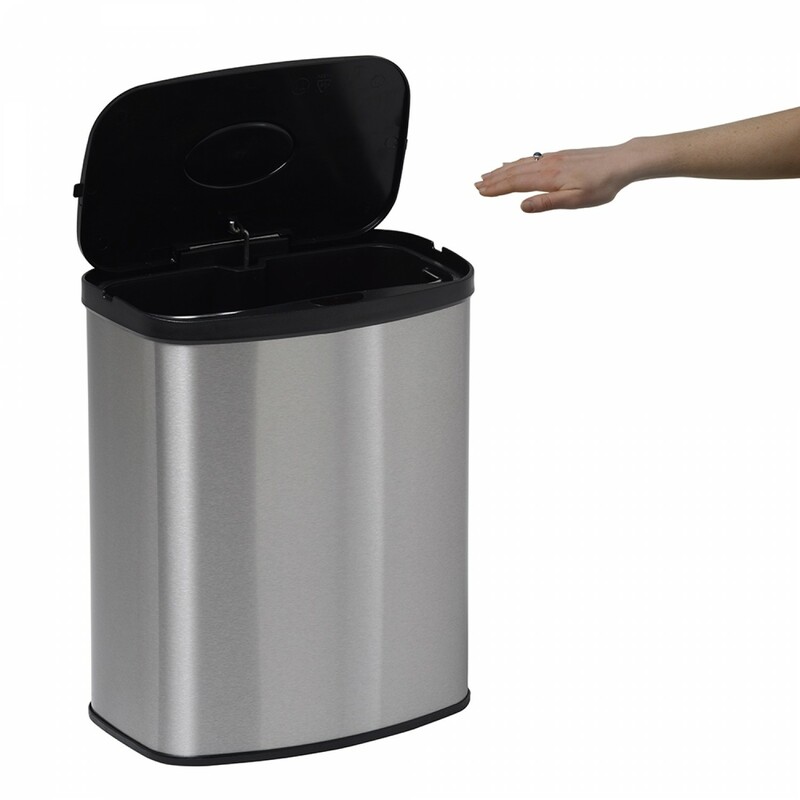 With a capacity of 8 litres, the food waste bin is perfect when space is limited or in areas where you want a small bin with all the technology and style of one of our larger stainless steel sensor bins. While other companies such as Simple Human reserve their sensor technology for larger, more expensive bins, we feel it is important to offer the same level of innovation with our smaller products. We believe that however small the bin, and wherever it is situated, hygiene and ease of use are essential. 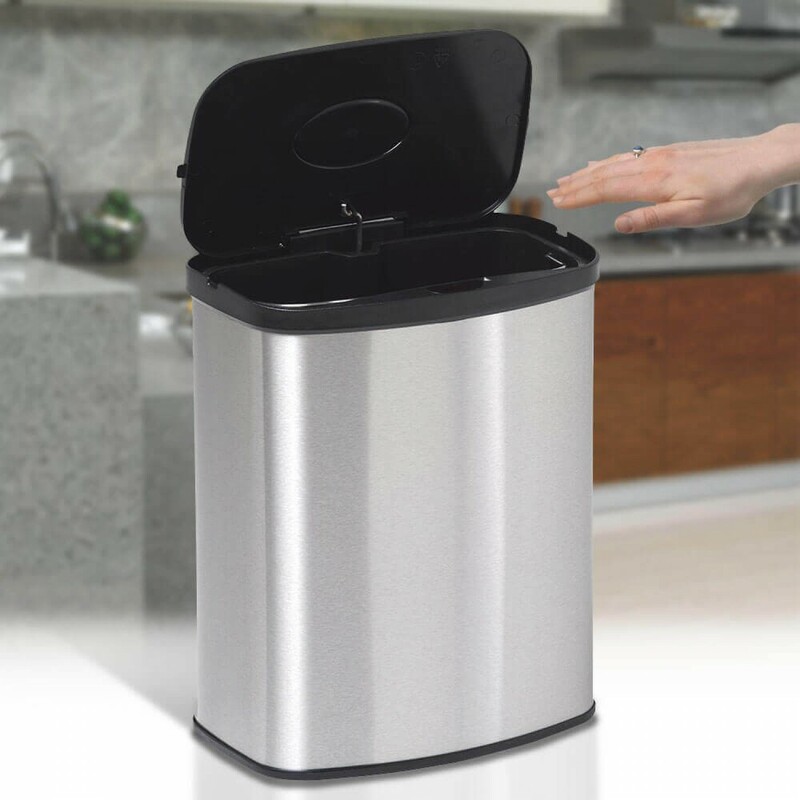 With a small capacity and a compact frame, the 8L kitchen food waste bin is also ideal for smaller spaces such as office cubicles, studies and mobile homes such as caravans. It is small enough to fit inside many cupboards so it is the perfect choice as an under-sink bin or for use inside a bathroom cabinet. The oval shape looks great in any setting and as well as being durable and robust, the stainless steel has a brushed finish which gives it a soft sheen that fits in perfectly with any décor and is easy to clean. It even resists fingerprints so you can maintain a clean, smear-free look for longer. As well as being easy to clean, the 8 Litre mini bin stays cleaner for longer thanks to the uniquely innovative touch-free operation that enables you to open and close the bin without ever touching it. This works via the sensor that makes each of our bins stand out from the rest – the infra-red technology means that the sensor picks up on movement and lifts the lid of the bin so it is easier, quicker and more hygienic for you to place the waste inside the bin. The hygiene implications of the mini bin are some of its most impressive features – not only is it cleaner and more pleasant not to have to touch the bin itself, preventing cross-contamination, this model comes with an inner bucket that your waste goes into, you simply remove the inner bucket by the handle to empty the contents into a larger bin and then replace it easily when empty. Most of the spills, leaks and hygiene problems that occur with bins come from a bin lining bag that slips down inside the bin or gathers (unattractively) around the outside of the lid. With the sensor bin, you don’t get this problem. We designed the 8L kitchen food waste bin to have the inner bucket because it seemed like the best option for such a small capacity bin. A bucket inside the bin makes it even easier to use, to empty and to keep clean. The result? A more hygienic bin, requiring less time and effort spent cleaning it and bin liners that are faster and easier to change when required.